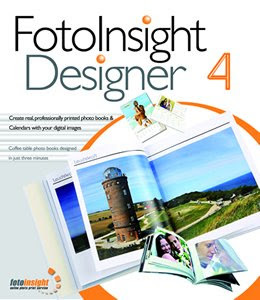 FotoInsight announces for Photokina the new 'FotoInsight Designer v.4' photo book software. September is the month of the world's biggest trade fair for the photographic and imaging industries, the bi-annual Photokina in Cologne. The leading players in the imaging industry's fastest growing segment - Photo Books - are getting ready to showcase their latest developments. FotoInsight announces a upgrade to its "Designer" software and new, even larger Photo Books. To provide space in which the favourite photographs can shine, photo book services like FotoInsight are constantly improving their software and their range. So far, most books printed with own photographs are limited to less than 100 pages. With the upcoming version 4 of FotoInsight Designer its photo books can feature up to 130 pages for the first time. After introducing XL Photobooks (12"x12" / 30x30cm) last year the software upgrade will add a new "XXL Photo Book" format (H12"x16" / H30xW42 cm) in stylish faux leather and with a traditional screw bound. In the new XXL format landscapes can be spread over 80 cm wide double pages. For this, FotoInsight is increasing the print resolution to 360 dpi. The software upgrade announced for Photokina shall be launched online on the 16th of October 2008. The clever Assistant in the FotoInsight Designer photo book software will then be able to design 130 page extra large photo books in under three minutes, For this the application automatically lays out the pages with the chosen images and can put these in order of date, file name or event. The new "Colour Sorting" tool will help when designing the album manually. The "Colour Sorting" tool in the upcoming FotoInsight Designer can put images in order of colour, helping to eliminate duplicates and to avoid the repetition of similar images. It is also a handy tool for an esthetically appealing design achieving the right contrasts between images. Another interesting addition to the upgrade is a new "Image Collage Tool", which can create a collage page of up to 199 images. The position of each individual image in the "Collage Tool" can be adjusted or changed, just as it can be done everywhere else in the book or photo calendar design. When designing a book page by page hundreds of templates in the free software help to position images. A "Help Grid" can be turned on in the application's editor window to provide optical guiding in positioning photographs and text. The size of the grid can be changed and the application can make pictures stick to the grid lines. An even finer positioning can be achieved by zooming into the editor. Any picture can go without, with a standard or an individual frame to set it apart from the background or layered images. Text can be written on any part of any page or it can be copied and pasted from a word processor or other application. This ensures that names and dates can be recorded and the text of for example a wedding speech can live on for future generations. Once the photobook of a holiday or party arrives everyone is cheering and many want their own copy. With the new release arrives what many regular FotoInsight customers have been asking for: the re-ordering option. During six weeks after an order a photo book can be re-ordered without having to upload the layout again. The Managing Director of FotoInsight Klaas Brümann comments: "The larger formats XL and the new XXL provide the space to preserve the favourite pictures from holidays and events in shiny quality. Books can be accessed at any time. Unlike videos and images on digital media there will never be compatibility problems with future digital standards. With your FotoInsight Photo Book simply turn the pages and enjoy, now and in a hundred years."